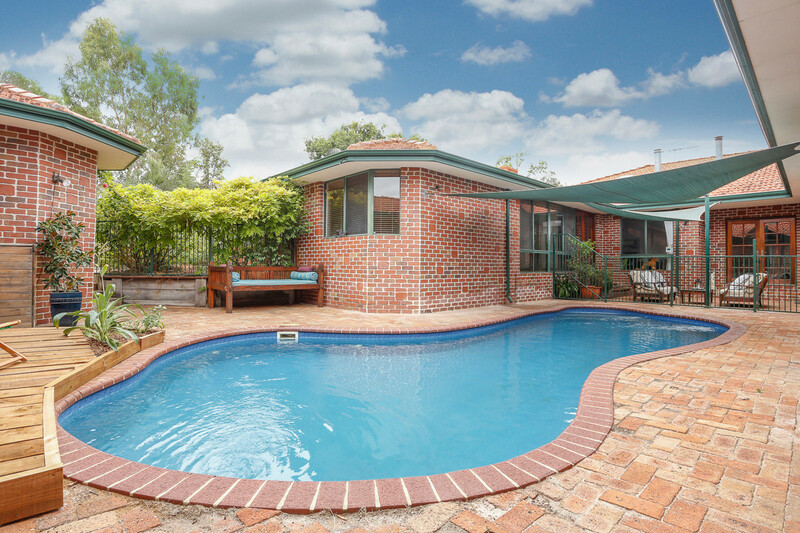 A Federation Classic and an enormous 660.88sqm under the main roof! 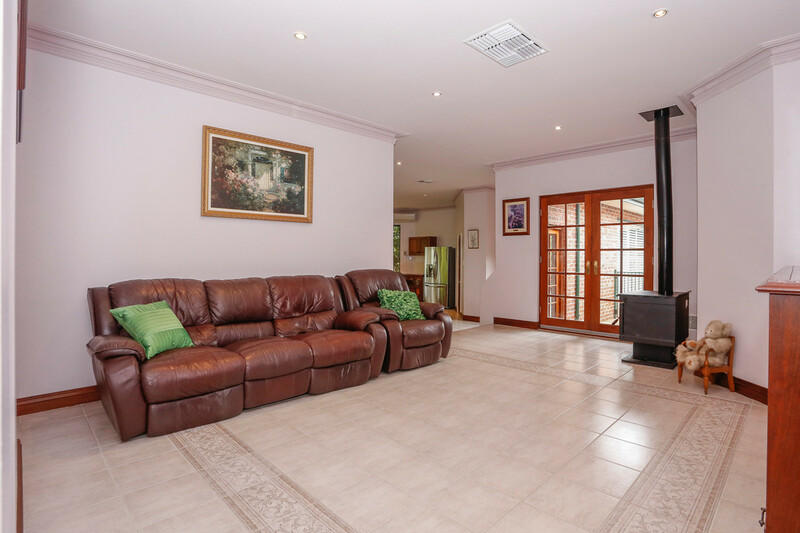 3m ceilings, decorative cornices and ceiling roses, jarrah doors, jarrah skirting boards, French doors, timber floors, everything you would expect from an individually designed home of quality. 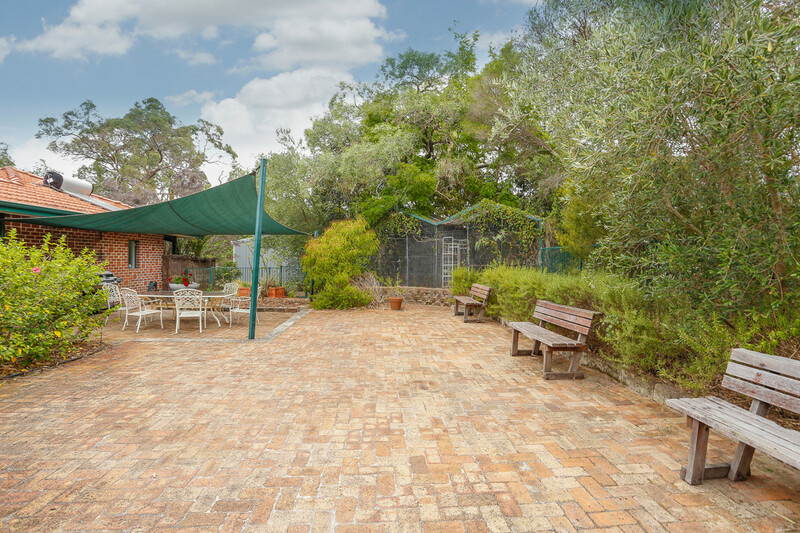 With the space of 660.88sqm and block size of 4117sqm it has the ability to accommodate a large extended family as well as home-based businesses and hobbies. You will never outgrow this property. THE BEDROOMS, 6 OR 8! 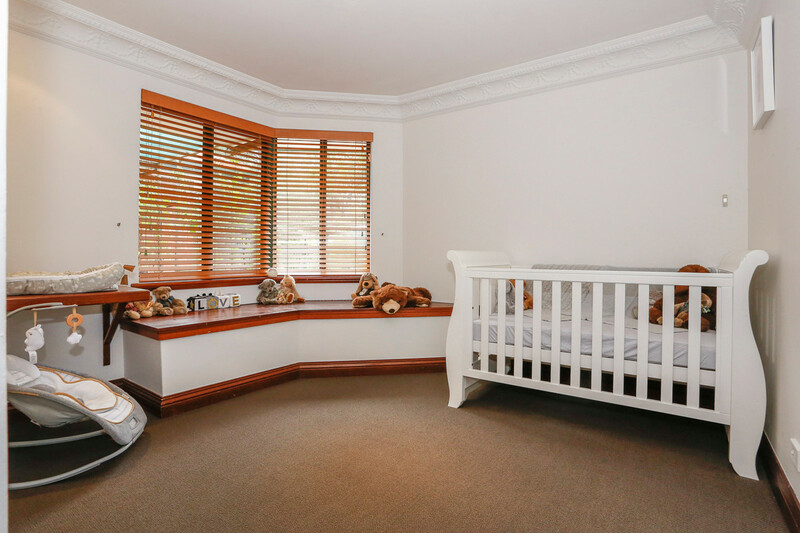 6 bedrooms plus a large study and sewing room that gives the option of 8 bedrooms if required. 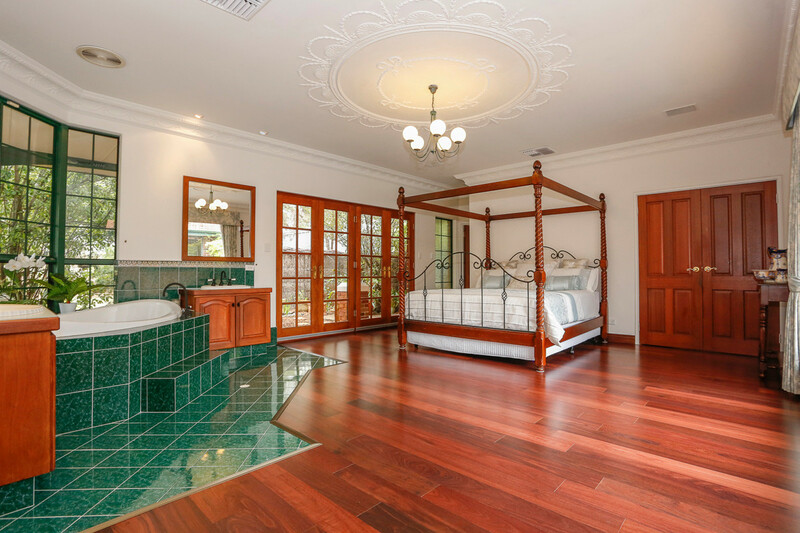 Master suite is very impressive with 2.75m ceilings, decorative cornice and ceiling rose. It has a functional dressing room with floor to ceiling mirrors and custom fitted drawers, shelves and hanging space. 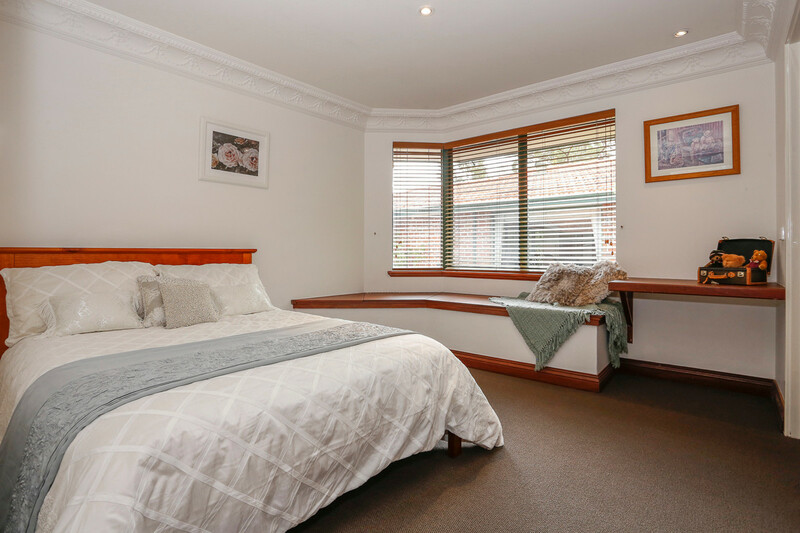 The bedroom has a large picture window overlooking the pool as well as 2 sets of jarrah French doors leading to a private courtyard with a water feature. Two vanities, two person spa bath, shower and WC. 2nd King size bedroom with custom fitted walk in robe, window seat with storage and built in desk. 2 Queen size bedrooms – one of these is a guest suite with built in robe, ensuite and private entrance. The other has custom fitted walk in robe, window seat with storage and built in desk. 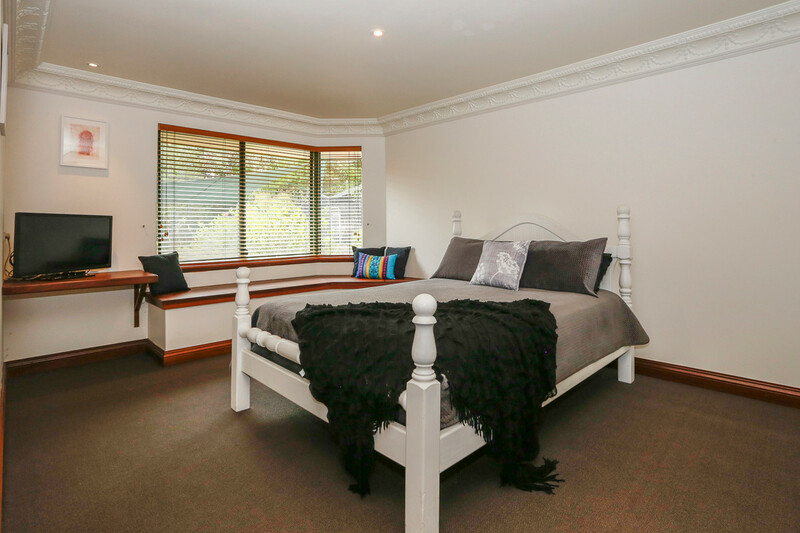 2 double bedrooms – one with private entrance, custom fitted walk in robe and built in desk. The other has custom fitted walk in robe, window seat with storage and built in desk. The Master bathroom consists of two vanities, a spa bath, separate shower and WC. 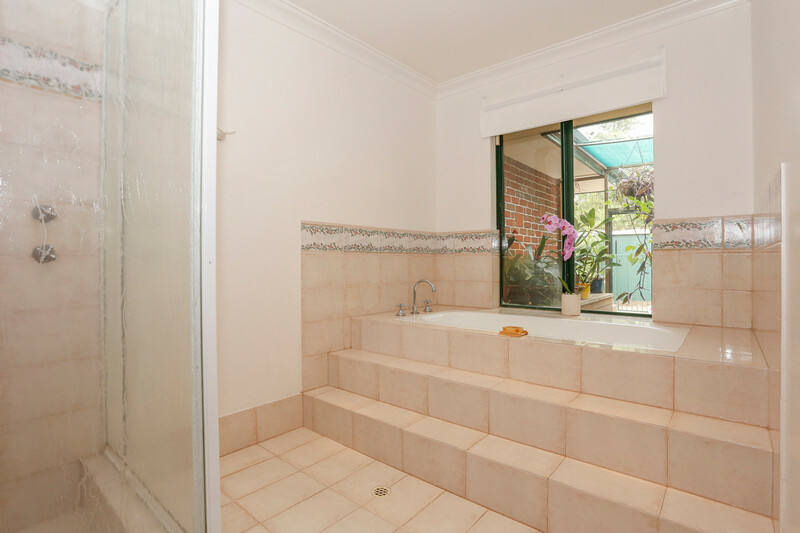 The pool bathroom has WC, single vanity and shower, can be accessed from pool area or studio. Main bathroom is 3 way suite with raised built in bath and shower room, separate room with double vanities and separate WC. 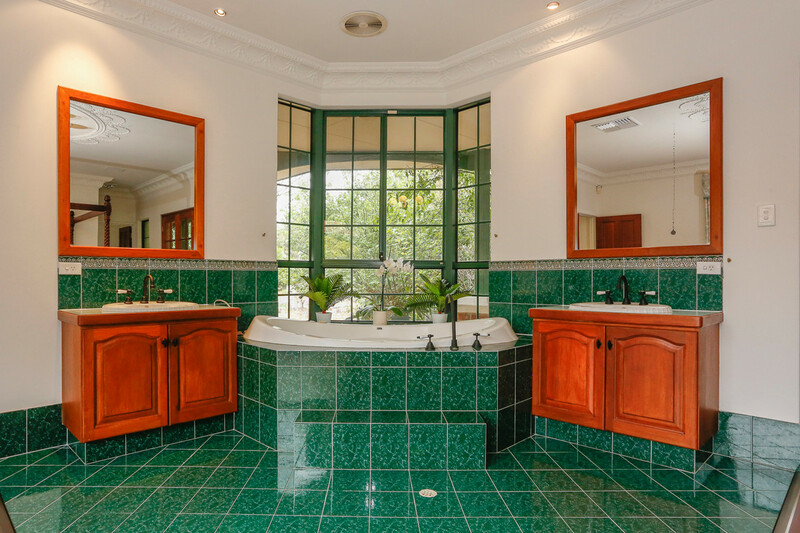 The 4th bathroom is in the guest suite and comprises shower, pedestal vanity and WC. There is also a 5th WC, vanity and shower in the shed. 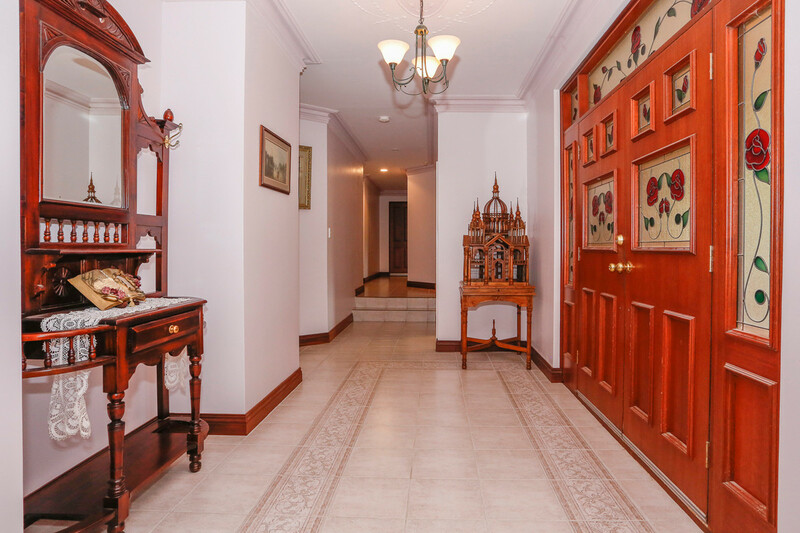 2 Family rooms, a Sewing/Toy room, Studio, Gym, Parents Retreat, Formal lounge and Formal dining room. The first area opens via French doors onto the pool area making an ideal indoor-outdoor room for entertaining. 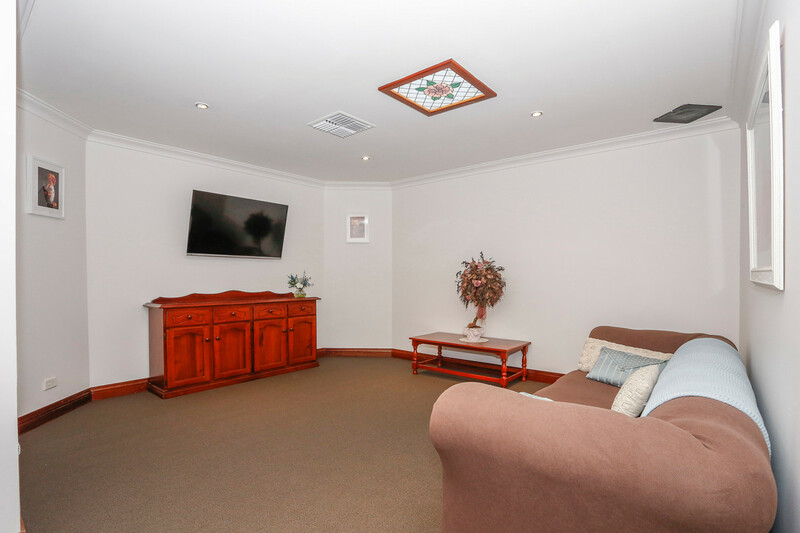 The second family room is currently used as the children’s theatre room. 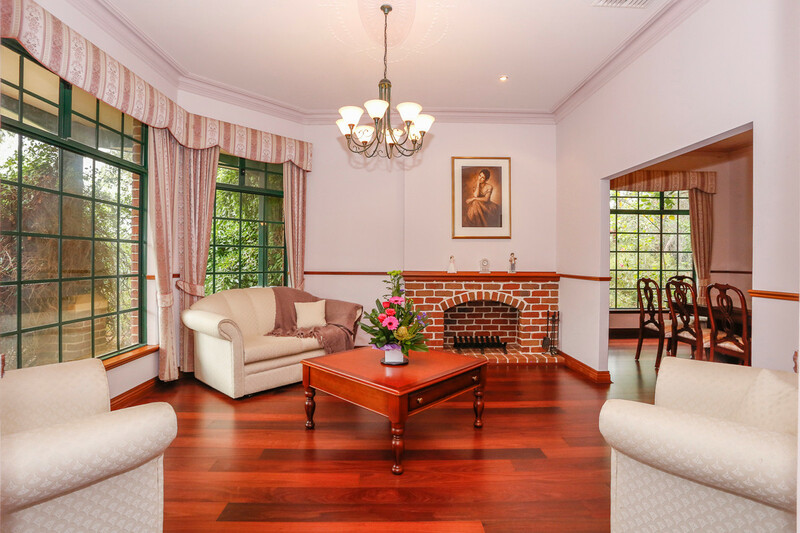 The formal lounge and dining room have 3m ceilings with ceiling roses, timber floors, jarrah skirtings and dado rails and a functioning fireplace. The studio is 8.1mts by 5.7mts with 3m ceilings, it has seen a number of uses including theatre and gym. It is currently used as a Pilates’ studio. It features 2 sets of French doors opening onto the verandah and a large picture window with plantation shutters overlooking the pool. 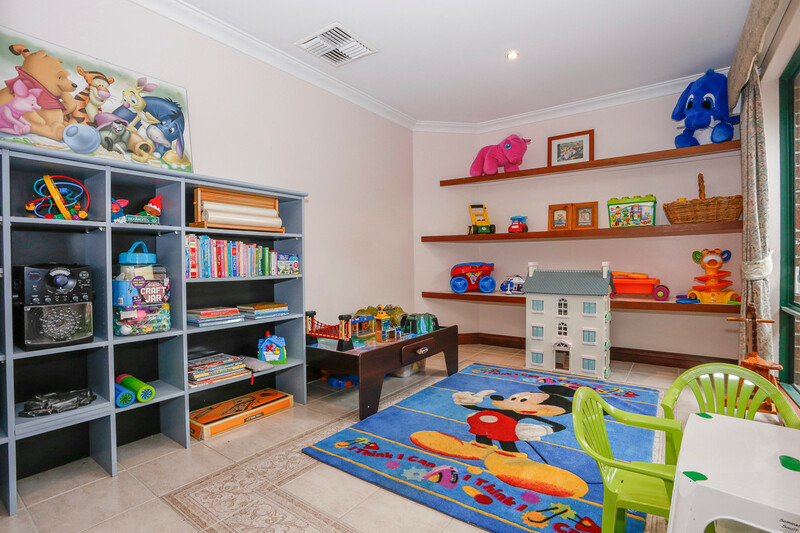 Also overlooking the pool is the sewing room, it is currently used as a toy room and has fitted shelving. The gym is at the rear of the garage and has a private entrance. 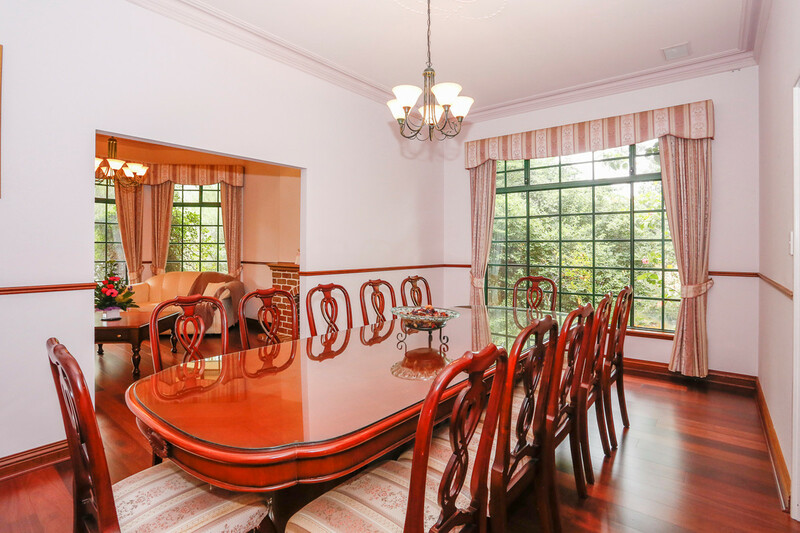 The kitchen was designed around a magnificent bay window that brings the outdoors inside, large amount of cupboard and bench space, a walk- in pantry, Belling 5 burner 3 oven range and range hood as well as Belling wall oven and French doors opening to the pool area. 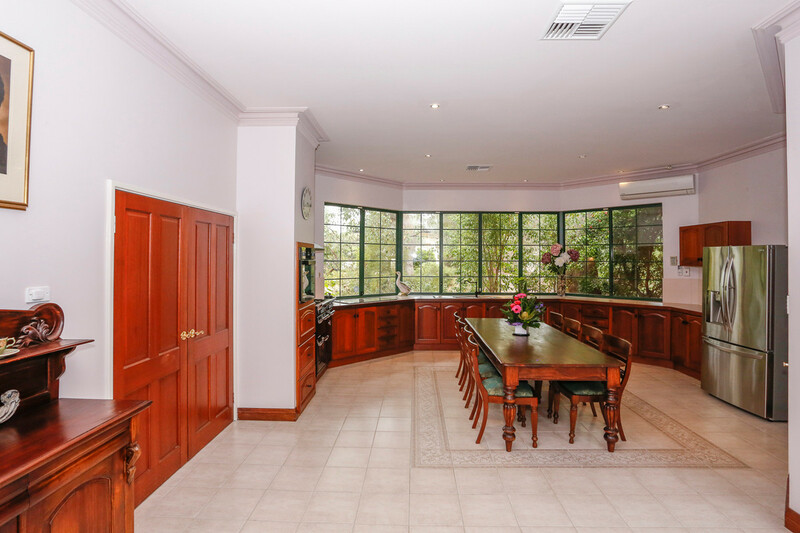 The dining room is adjacent to the kitchen and can be opened up to the kitchen by double jarrah doors. 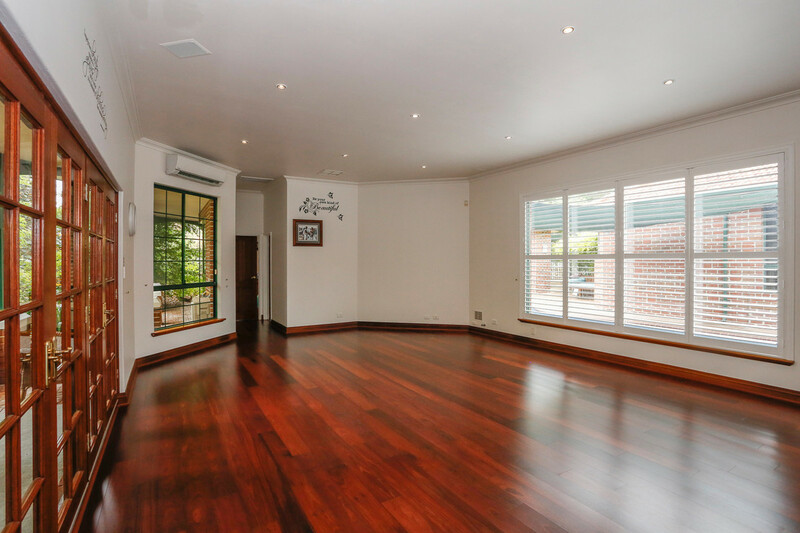 It has timber floors, 3 metre ceilings, ceiling rose, jarrah skirtings and dado rails and a large picture window. 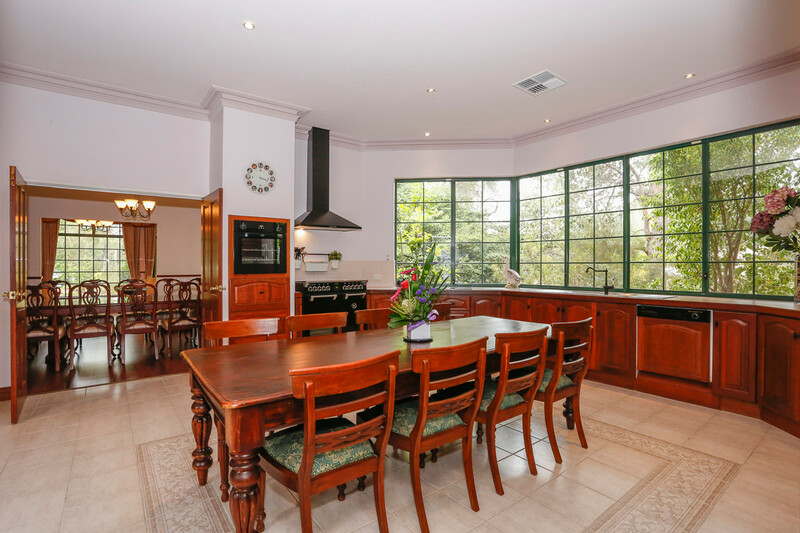 Large enough to entertain the largest of gatherings the dining room will comfortably seat 12 opening to a further 10 in the kitchen. This versatile area could easily seat 30 for big family celebrations with the addition of a second table in the kitchen. The kitchen is over 6mts wide and 7mts long. 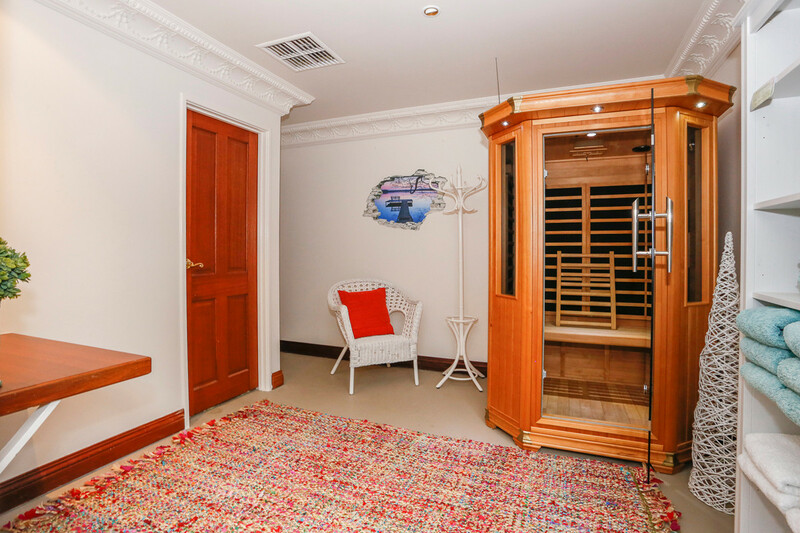 The home has two large home offices, one with outside access via French doors. 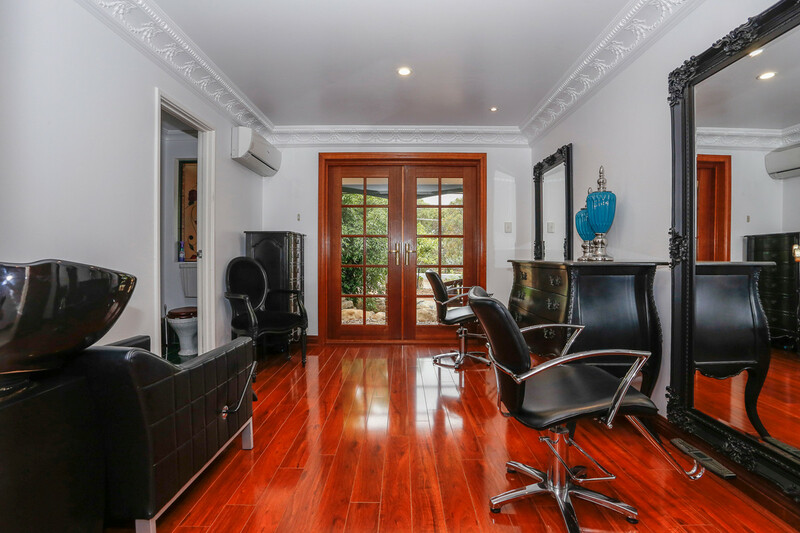 The guest suite is currently being used as a fully shire approved hairdressing salon with 2 stations, it can be very easily converted back to a guest suite by the current owners. Bedroom 5 is currently being used as a sauna room with a private entrance, but can be converted back to a double bedroom by the owners. The pool is a 10-metre free form salt water pool, it is completely surrounded by the house on all sides offering the ultimate in privacy. There are three seating/lounging areas, one at each end of the pool and a daybed tucked under a wisteria for shade. 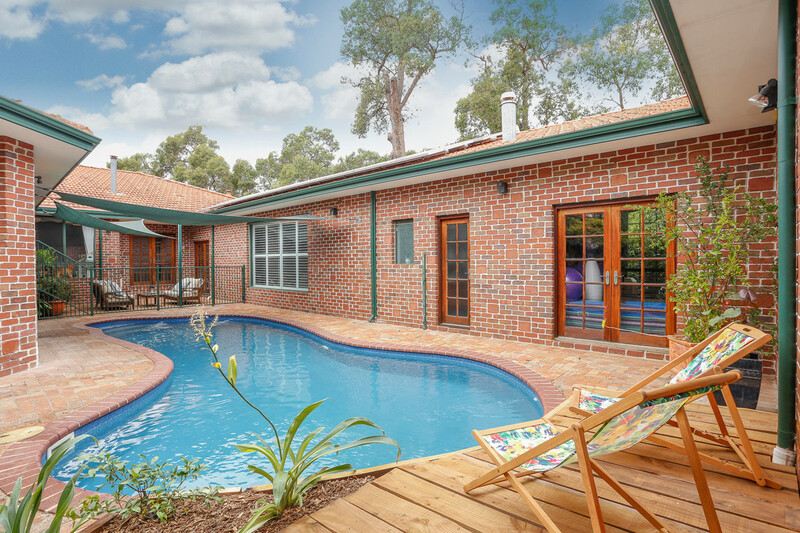 The pool area can be accessed by any one of four sets of jarrah French doors as well as the pool bathroom. 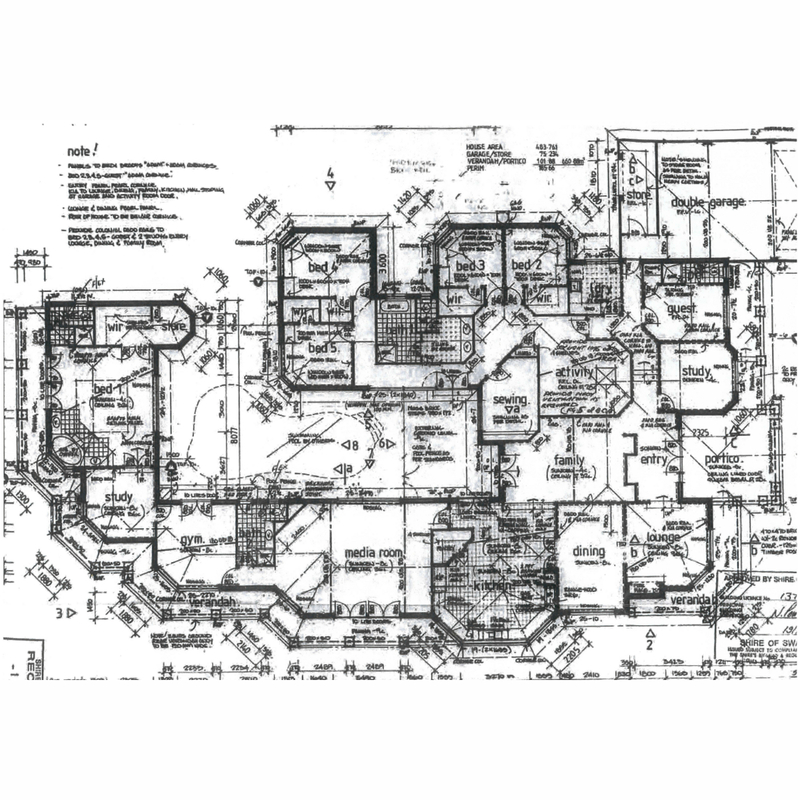 The home has two ducted evaporative air conditioning units and 4 reverse cycle split systems. 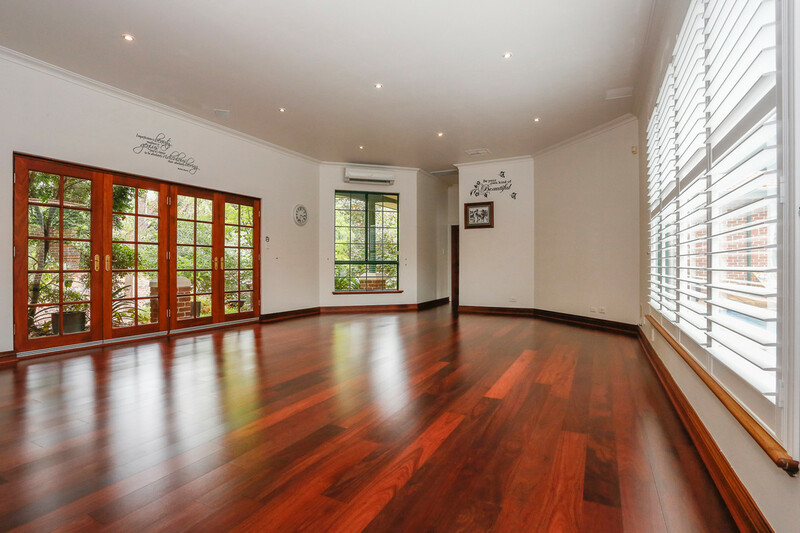 Because of the design of the home, wide verandas, tall trees, high ceilings the cooling systems are only required on the hottest of days. Heating, when required, is via two wood burning fires or from the reverse cycle units. There are also 5 gas bayonet points throughout the home. The home has 24 solar panels on the roof, they generate a large portion of the home’s energy requirement. The home also has two solar hot water systems with electric boosters. 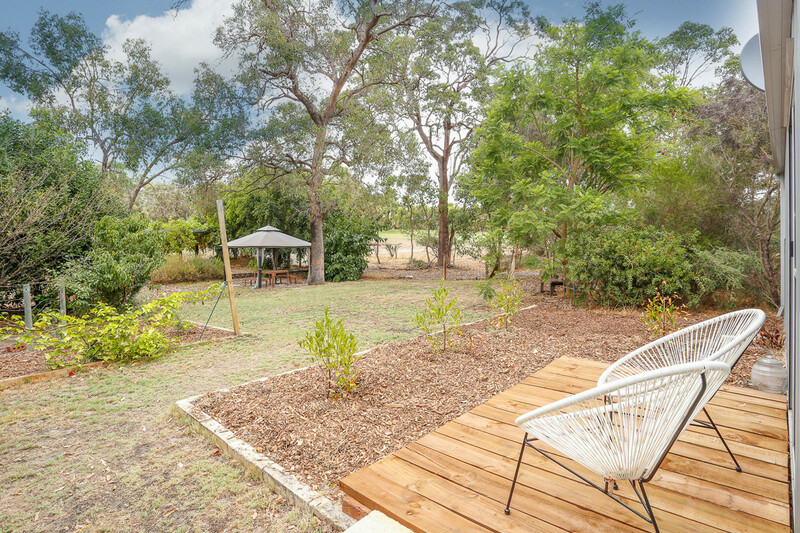 A large shed (48sqm) at the rear of the property has full amenities: reverse cycle air conditioning, WC, hot and cold water, wall and ceiling insulation. Ideal for multiple usage: games room, man cave, storage etc. 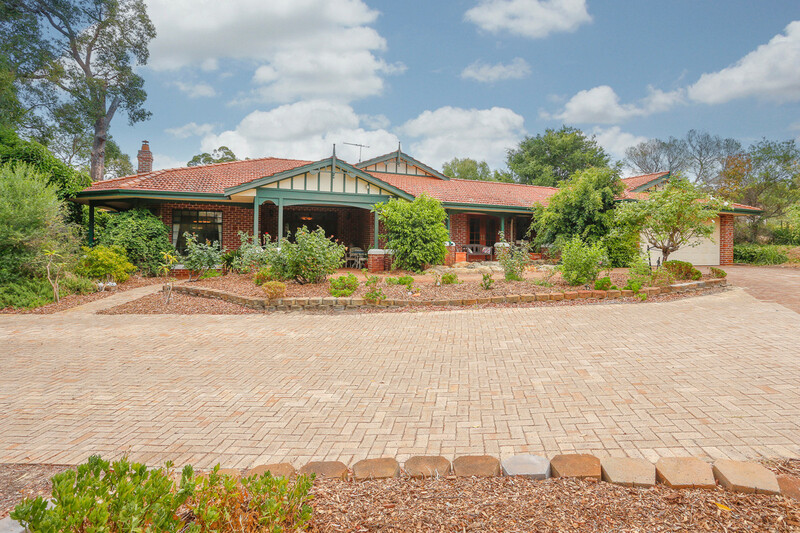 The paved areas at the front of the home can fit up to 14 vehicles. Ideal for someone who wants to run home based business or store caravan, boats etc. 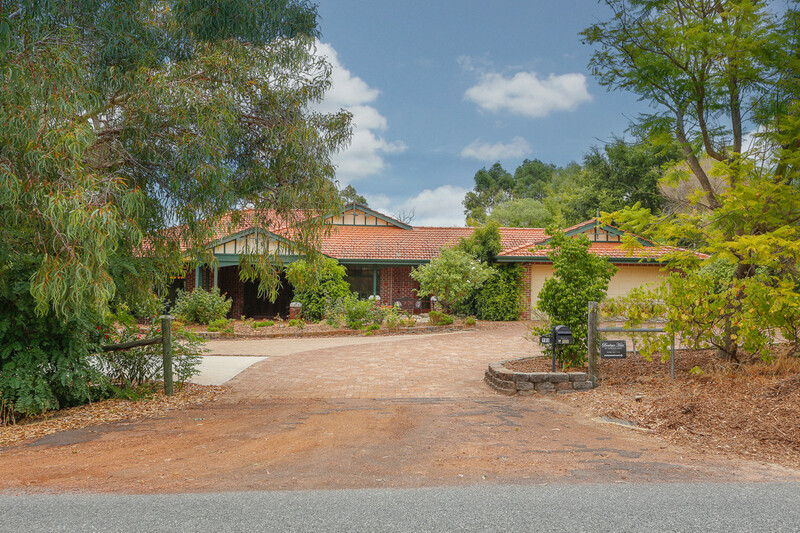 The double garage is 6.5mtrs x 6.34mtrs with power points and automatic tilt door access. This impressive home is ready for you to move in and enjoy!